Rock_1.....................8772 polygon. ...........................8774 vertices. 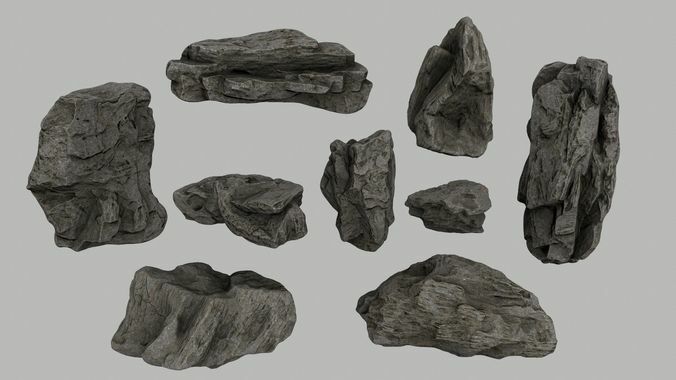 Rock_1_Lod_0...............2880 polygon. ...........................1442 vertices. Rock_2.....................6941 polygon. ...........................6943 vertices. Rock_2_Lod_0...............2312 polygon. ...........................1158 vertices. Rock_3.....................7911 polygon. ...........................7913 vertices. Rock_3_Lod_0...............2535 polygon. ...........................1270 vertices. Rock_4.....................7000 polygon. ...........................7002 vertices. Rock_4_Lod_0...............2330 polygon. ...........................1167 vertices. Rock_5.....................8447 polygon. ...........................8449 vertices. Rock_5_Lod_0...............2782 polygon. ...........................1393 vertices. Rock_6.....................7318 polygon. ...........................7320 vertices. Rock_6_Lod_0...............2482 polygon. ...........................1243 vertices. Rock_7.....................7468 polygon. ...........................7470 vertices. Rock_7_Lod_0...............2519 polygon. ...........................1262 vertices. Rock_8.....................8253 polygon. ...........................8255 vertices. Rock_8_Lod_0...............2744 polygon. ...........................1374 vertices. Rock_9.....................7829 polygon. ...........................7831 vertices. Rock_9_Lod_0...............2536 polygon. ...........................1270 vertices.